Produced from 1983 to1985, this is IBM's attempt at penetrating the "home computer" segment of the market. A smaller version of the IBM PC, the jr featured a tiny battery operated "Freeboard" keyboard which operated with no wires, through sensors. IBM BASIC was in ROM. Also featured were two cartridge ports on the front. 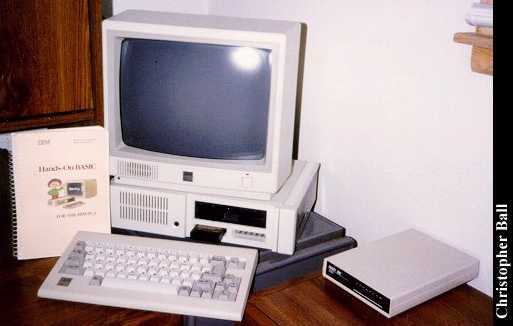 The jr had an 8088 processor, CGA, and one 5 1/4" 360k floppy drive. The jr was initially announced in October 1983 for $700(US). When it finally shipped in March 1984, the list price was $1300(US) for the base 64k version with no monitor. IBM stopped production of the jr in April 1985. One of the reasons for the jr's demise was its name: the jr was not taken seriously. It was seen as a toy. Knowledgeable computer buyers were aware of the jr's proprietary architecture. Nothing on the jr has standard interfaces. The monitor, drives, memory, and expansion slots are all non-standard. The jr used external side-cars for most of its expansion. About this computer: this jr has 128k, a parallel port side-car, and Cartridge BASIC. It still works flawlessly. My grandmother uses it for word-processing! Click here to view all comments for the IBM PCjr and to leave your own.